Kyou, having been cast out of Foo Foghters, finds the world of Vanguard unwelcoming. Episode 41 of Cardfight! 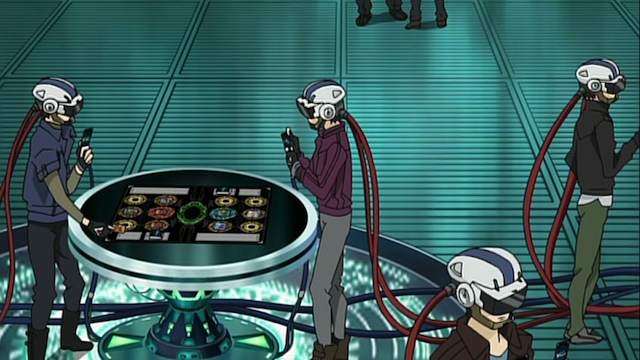 Vanguard was the best episode in a while. Kyou is one of the crazier opponents that Team Q4 has met, and he has a real grudge. In addition, Aichi is going over the edge as well. His friends are all starting to notice that his personality is changing, and this more confident personality gives Aichi’s seiyuu an opportunity to shake up the way he is played. The result is a much more tense and exciting match than I would have imagined. Inside the Foo Fighter's secret training facility. In addition to playing off Kyou as an over the top villain, we get some unexpected insight into Team Foo Fighter. Unlike most teams that hang out in a card shop, the Foo Fighters have a high tech training facility in a steel and glass sky scraper. Due to his loss against Kai, Kyou’s ID badge is destroyed, and he is thrown out. Unfortunately for him, nobody will take him in, no matter where he goes. In the end, his desire for revenge takes him to some other former Foo Fighters, and they form Team Avenger. Aichi with the specter of Ren hovering over him. 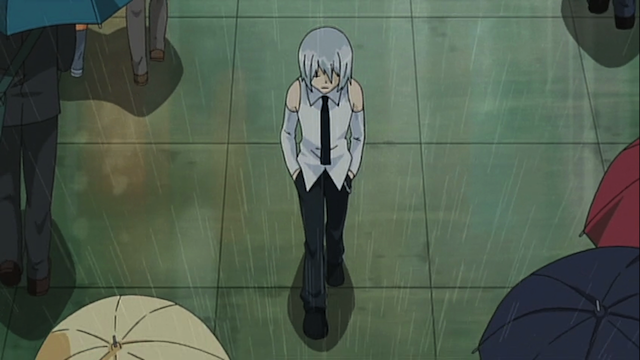 Kyou wants a rematch with Kai, but Aichi says he will play. Kyou starts his maniacal laughing until Aichi declares that he will will, and selects a grade 1 card that he says he will use in his victory. 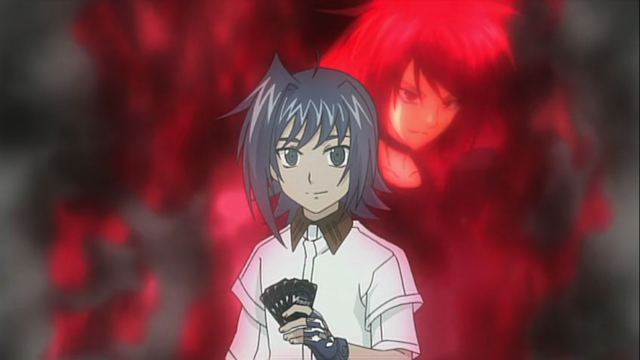 Aichi has always been timid, so his bragging comes as a shock to everyone, except Kai, who seems to suspect that Aichi is becoming possessed by the power of the cards. Lucretia has a detailed theory about this. I must say, the combination of Kyou’s maniacal laughter and Aichi’s turn to the dark side really made for an entertaining episode. Now I’m looking forward to seeing what exactly happens. Will Aichi win, but at the cost of being consumed by the beast of Cray? Hate to admit this but… Aichi’s becoming more of a badass! It was good to see him like this. Confident — even arrogant. Very different from the days he would worry about everything. The part that got me ramped up with this episode was not only Aichi’s arrogant talk, but the way he talks. He’s talking exactly like Ren, the same calm, cocky inflection, like he’s schooling a little child. Yeah, it is a refreshing change for the character.